More than 100 years ago Clemente Park was the site of one of the most modern baseball stadiums in America. Built in 1906 and named Washington Park, the baseball stadium had 3500 seats and was home to the Lowell Tigers of the professional New England Baseball League. The Tigers had been playing on Spalding Park since 1902, but Spalding Park – now Stoklosa-Alumni Field on Rogers Street – was too far away for fans living near downtown Lowell. Al Winn purchased the Tigers in 1906 and decided to build a brand-new ballpark closer to downtown Lowell. He chose a site along the Pawtucket Canal in the lower Highlands that was near the city’s main train station on Middlesex Street (which was underneath today’s Lord Overpass). At a cost of more than $10,000, Winn built a state-of-the-art ballpark with 3500 seats, 1500 of them under a roof. All were opera-style seats and not the traditional backless benches of other parks. There was also indoor plumbing and locker rooms with hot showers for the players (a novelty at the time). Because of the dimensions of the lot, the right field fence was closer than usual. A contest was held to select the park’s name. Washington Park was the winning name. Washington Park officially opened on April 27, 1907. The team was initially successful, but the owner’s abrasive personality soon turned people off and attendance dwindled. In the midst of the 1909 season. The New England League ordered Winn to sell the team. He did, offering to rent Washington Park to the new owners, but they instead chose to play home games back at Spalding Park. Without a baseball team, the stadium at Washington Park was neglected and was eventually torn down. On December 8, 1921, the city of Lowell Board of Park Commissioners took the 120,000 square foot parcel by eminent domain for use as a public playground, paying $30,800 to Mary L. Saunders, Annie G. Saunders, and Edith St. Loe Saunders, whose family had owned the land for at least fifty years. Washington Park was given attention during the year. Two plots of land were acquired near the Franklin School and graded, making a more convenient entrance from Lowell Middlesex Street. Considerable grading was done in this park which brought the surface to an even grade. Some 1800 yards of good filling which we obtained gratis, was used in this work. A baseball diamond was laid out, and a good backstop built as well as an 8-foot wire fence constructed so as to protect the adjoining property. 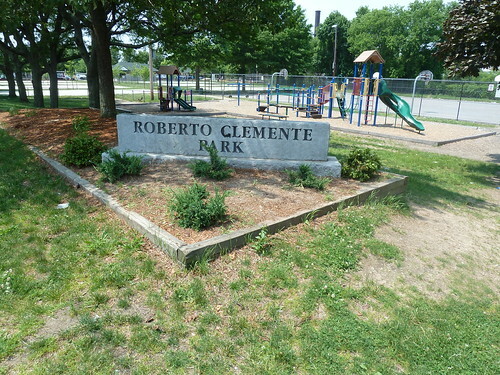 The park kept the name Washington Park until July 10, 1973 when the Lowell City Council passed a motion by Councilor Phil Shea to change the name from Washington Park to Roberto Clemente Park. Roberto Clemente was born in Puerto Rico in 1934 and played professional baseball for the Pittsburgh Pirates from 1955 until 1972. His Pirate teams won the World Series in 1960 and in 1971. He was the MVP of the ’71 series and was the league MVP in 1966. His career batting average was .317 with 3000 hits, 240 home runs, and 1305 RBIs. He was a 15 time All-Star and a four time National League batting champion. Throughout his career, Clemente involved himself in charitable work in Puerto Rico and throughout Latin America. He died on December 31, 1972 at age 38 when a plane he had chartered to fly relief supplies to earthquake-ravaged Nicaragua crashed, killing all aboard. Clemente was posthumously elected to the Baseball Hall of Fame in 1973, making him the first Latin American baseball player so enshrined. The same summer that the city named the park for Clemente, the city council also voted to install powerful “arclights” that would allow adult softball teams and Little League baseball teams to play night games at Clemente Park which joined St. Louis Field as the two city parks illuminated for night softball games. In the 1980s, thousands of Cambodian refugees came to Lowell. Many settled in the lower Highlands neighborhood. Clemente Park became an important gathering place for members of the Cambodian community. They did not play baseball or softball, so those fields were eventually replaced by volleyball and boule (bocce) courts. There is a playground for children and in 2011, the city of Lowell build a permanent concession stand on the park. Members of the Cambodian community refer to the park as Pailin Park. The Cambodian community also created a “healing garden” that is dedicated to those who died or fled their homeland. The garden contains a yellow Stupa monument. Each of the four sides of the monument is inscribed with Khmer script representing the “four immeasurables” of loving-kindness, compassion, empathic joy, and equanimity.” The park also contains two benches decorated with tiles painted by high school students. 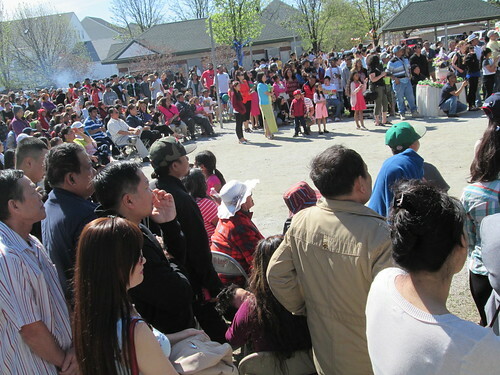 Today, Clemente Park serves as one of the social and cultural centerpieces of the Cambodian community in Lowell. While it is hardly the most pressing issue facing Lowell,this is an obvious moment to discuss the name of the Park. More than a decade ago , The Hall of Fame in Cooperstown recast the plaque to read Roberto Clemente Walker reflecting the Hispanic custom ; previously , it had been Roberto Walker Clemente. The City renovated the Park not long ago and either did not know or did not care about this issue.